The Dodgers Are The 2016 NL West Champions- But How?! On June 26th in Pittsburgh, Clayton Kershaw had his worst game of the season. That isn’t saying too much, given that he only had one bad inning- LITERALLY ONE BAD INNING– the entire season, up until that point. Not only was he arguably having the greatest season for a starting pitcher ever, but outside of Corey Seager, was just about the only Dodger on the field worth the price of admission. The Dodgers would end up losing that game. Far more horrifically, they would lose Kershaw himself, to a back injury. At 8 games back, it appeared to be an early nail in the coffin for the 2016 Dodgers, who looked absolutely hapless for the 4 out 5 games that the 3 time Cy Young award winner was reduced to dugout cheerleader. Instead, it became a turning point. Here we are, in the same spot we’ve found ourselves since 2013- with the Dodgers celebrating a first place finish, by a surprisingly comfortable margin. Coincidence or not, the team really seemed to wake up with Kerhsaw’s injury, particularly the offense. 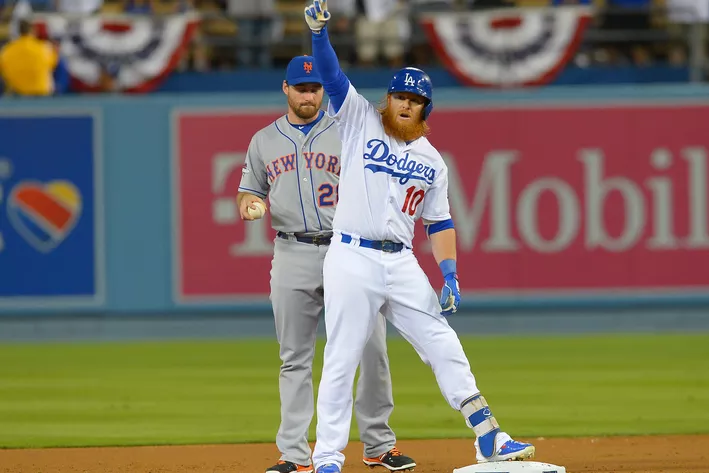 One of the main contributors, Justin Turner, had also anchored the 2014 comeback, when he came out of nowhere to become the Dodgers best hitter in the second half of that season. (He didn’t quite reach those heights this season, but he wasn’t far off.) In hindsight, ironically enough, that game in Pittsburgh seemed to be something of a turning point for his season, personally, providing the only offense in that loss. Joc Pederson, Adrian Gonzalez and Yasmani Grandal also came to life shortly after. Promising outfield rookie Andrew Toles picked up where Trayce Thompson left off early on, while Chase Utley and Howie Kendrick turned out to be smart veteran re-signings. Even Andre Ethier, as unlikely a Dean of The Dodgers as there ever was, made a cameo appearance in September, after recovering from an unfortunate fluke injury that took him out for nearly the entire season. And then there’s Yasiel Puig. I don’t think the writers at Friends brought out the, “Will They Or Won’t They?” storyline for Ross and Rachel, as many times as we’ve seen Puig go from Hero-To-Zero and back again. After a fantastic first few games this season, Puig spent the next few months largely in oblivion, losing not only his starting spot, but his spot on the Major League roster. It’s a true shame, not just for the Dodgers, but for Major League Baseball, a sport that NEEDS Puig to be relevant, if not a star. The good news is that after spending some time in purgatory (aka Oklahoma), Puig seems closer to being a hero again, helping the Dodgers with their final push towards the finish line by unhinging Madison Bumgarner, in a way that only Puig can. Well…maybe not ONLY Puig can, but no one does it better! But while the Dodgers offense coming to life somewhat explains their life after Kershaw, the pitching is much more baffling. Kenta Maeda was good, but rarely got past the 6th inning. Nobody else achieved a double digit number of quality starts. The only one who came close- Scott Kazmir with nine- had a 4.56 ERA. The bullpen, outside of Kenley Jansen, was made up of retreads and no names, yet they got the job done consistently, particularly Joe Blanton- and they were relied upon A LOT. It sounds inconceivable, but the Dodgers second half steamroll came in an environment where more than half the games were bullpen by committee. It was such a mess, Rich Hill became the first Major League pitcher ever to be pulled while throwing a perfect game (!) after 7 innings, because that’s just how fragile the Dodgers’ starting pitching situation was. And how about Dave Roberts, the man in charge who made that controversial but understandable decision? (It wasn’t even his first one this season.) If anything, he deserves a bonus for the arrows he took for his tough decision making, and ultimately should be rewarded by being named NL Manager of the Year. Everyone knows how great Joe Maddon is, but he had a far superior roster. Giving the award to the Cubs skipper would simply be a recognition for the guy who helms the team with the best record, without any regard to the circumstances. Dave Roberts managed to deal with one of the most injury-plagued teams in franchise history, and he did so in his first year with the team. He had to make CONSTANT adjustments, and he met the challenge brilliantly. We have a few extra weeks before the ink dries overall, but the fact that he even got the team THIS far is already something that he should be proud of. As for the front office? That’s a tough one. Their methods are controversial and often maddening to those of us who appreciate a more traditional, simple approach to baseball. The smug attitude of some of their defenders can be even MORE maddening. But it can’t be denied that after two years of constant roster moves, their formula has been successful more than not, even when many of us were convinced that it would fail. This season, in particular, has been a real triumph for them, not shelling out 9 digit contracts to Zack Greinke- or Johnny Cueto, for that matter- yet finishing with far better records than those teams who did. Of course, that’s not to count out the Giants for the postseason- it IS an even year, after all. But in a 162 game schedule, half of which was played without Kershaw, credit needs to be given where credit is due. So well done, Andrew Friedman and Fahran Zaidi. Two cheers for them each. We’ll see what October brings. For a group that seemingly shrugged off the “small sample size” of Matt Kemp’s red-hot 2014 ending, the Dodger front office sure have put a fair amount of stock into 31 at-bats from Chase Utley. To be fair, it’s been a GREAT 31 at-bats since the longtime Phillie icon came back from his latest stint on the disabled list. Plus, there are thousands and thousands of previous Utley at-bats coming into this season, which will unquestionably put him on a Hall of Fame ballot one day, if not the Hall of Fame itself. However, it’s those at-bats in between the first 6,000+ and the last 31 at-bats- more specifically, the 218 of them where he was batting .179 prior to going on the DL- that could be troubling. Name recognition aside, the potential for this move to make an earth-shattering difference either way doesn’t seem to be all that likely. Regardless of how Chase Utley plays for the duration of 2015- or even IF he plays for the duration of 2015- his success is not critical to the Dodgers’ success. Of course, it would be NICE if he can play somewhat like his old-self instead of like an old man, but if not, Kiké Hernández has shown that he is more than capable of holding down the fort in Howie Kendrick’s absence. In fact, Kiké’s performance has been so solid, it makes this move rather curious to begin with, though not as curious as the deafening silence from the media, old and new, about the initial trade last December, which ultimately led to this latest move being made. There’s no need to rehash the whole Dee Gordon saga again, at least not right now. But it would be negligent to not at least MENTION that the former Dodger and current All-Star starter has emerged as the player many of Dee Gordon’s fans always suspected he could become. By contrast, the Dodgers have now added a SECOND second base veteran to the mix, before the first season without Gordon has even been completed. And they’re doing so at a considerable cost, both on the field and in the payroll. (Did we mention that the Dodgers are also still paying Dee Gordon, as well?!) All of this seems to have gone unnoticed by most, outside of the few Dodger fans not currently fuming at Don Mattingly for causing global warming. Bloggers, print writers, and those that generally spend a lot of time thinking about the Dodgers seem to have overlooked how unnecessary this would all be, had Friedman’s crew not been so busy calculating how quickly Gordon would “regress to the mean”. 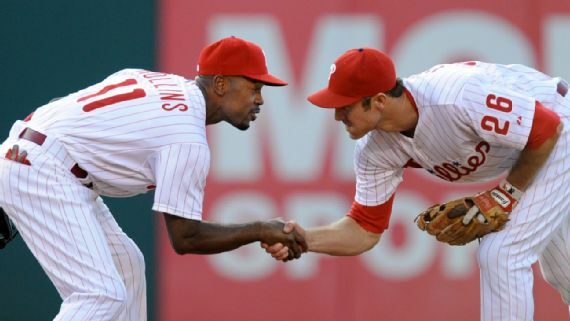 So whether this Utley trade works out or not, the reaction to it is already quite different than the kind that Ned Colletti would get for a similar move, even moves that, in hindsight, seem more understandable than the one that sent Dee Gordon to Miami. “One day, we shall meet again.” And they have. Pat Burrell patiently waits by the phone. The latest chapter of this grand experiment begins in Houston, where the Dodgers take on a team roughly equal in talent, if not payroll. With a mere month and a half to go in the regular season, it’s unlikely there will be yet ANOTHER chapter added by this all-too-active front office, but if so, let’s just hope it’s one that deals with the bullpen.